The Brazen Animation headquarters, not far from NorthPark Center, is a low-lit space filled with cartoons in the making. None of its handful of animators appear to be working on the same thing or even the same style of things. Their computer screens flash with a mix of stylized 2-D characters, beautiful digital paintings, and once-flat scenes are freshly rendered into three glorious dimensions. Brazen is a high-end creative animation studio that does work for clients such as Ford, Samsung, the Dallas Mavericks, Mary Kay, and McDonalds, as well as creating short and feature films. They write scripts and develop ideas. 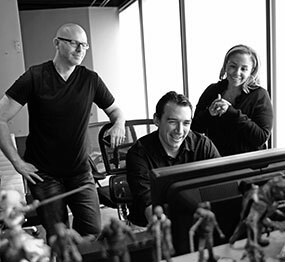 “We’re not an execution studio, we’re truly a creative studio,” CEO and CCO Bryan Engram says. The talented, collaborative staff of 30 has résumés that include big names, such as Pixar, Sony, Blue Sky Studios, and Disney. At the heart of the company is one important goal: good storytelling. Storytelling is, of course, a major way that we understand the world around us. We instinctively search for beginnings, middles, ends, and explanations. We learn from stories’ deeper meanings, emotionally invest in the characters, and discover things about ourselves in the process. And even within the confines of animation, there are many ways to tell a story. At any given moment, Brazen has simultaneous 2-D and 3-D projects in progress (the company’s animators are required to do both). One of Brazen’s works-in-progress is a 2 1/2 minute short that features a squat sea captain on a stormy sea. As he reflects on the various losses he’s endured throughout his life, the tranquility of his ship’s cabin is juxtaposed with the swirling tempest outside. As the “storm” tears his ship apart, the captain is forced to come face-to-face with this apparent manifestation of his pride. Not all the scenes are complete yet. The ones that are come to life in a series of frame-by-frame paintings rendered into three dimensions: a subtle shift in color that changes the mood, the light of a single candle, and the texture of the cabin’s curtains. The difference between each original painting and the scene it inspired is mostly limited to the shift to 3-D alone. The storytelling experience becomes even more immersive in the form of virtual reality. In the large space next to the Brazen Animation’s conference room, you might find Mark Therrell (his previous work includes Electronic Arts and Pixar, where he worked on Elastigirl from the Incredibles), tinkering with an Oculus virtual reality headset. When you put on the headset, suddenly the story of the sad sea captain becomes your own. If you glance down, you’ll notice the fibers in the carpet. If you glance right, you’ll see the dappled light on the curtains. Virtual Reality (VR) is the next frontier of storytelling. It’s a combination of the best parts of 2-D and 3-D art, plus an ability to draw the audience right into the scene. Additionally, Brazen uses the headset as a camera rig to create realistic angles in animation, giving the viewer an unmistakably genuine sense of movement. Soon, VR headsets will be available to consumers. People will start taking them home and transporting into the scenes of their previously passive entertainment. Virtual reality doesn’t just heighten the user experience, and it’s not just a matter of good graphics. It provides a deeper emotional investment in the story that’s being told. “You can look at animation in terms of phases,” Bryan Engram says. Brazen Animation has a set of core values exemplified by their cartoon mascot, a flame-headed character who symbolizes, more or less, the spark of human ingenuity. The little guy — or concept, or whatever he may be –- was present during the greatest strides in human achievement and invention, from the writing of Homer’s poetic masterworks to Queen Elizabeth’s autonomous reign to the Wright brothers’ pioneering of modern aviation. Brazen Animation’s own story is an evolution of immersive storytelling, made up of what’s come before (old-school, stylized 2-D cartoons), what’s commonplace now (a textured, vibrant 3-D world), and the sci-fi-sounding innovations of the future (making the viewer a part of that world). dcustom: An award-winning content marketing company that began as an extension of D Magazine. Customers include HP, Omni Hotels, Nestlé Purina PetCare Company, and Texas Farm Bureau Insurance. 2017 recipient Lyda Hill will present the award at the fourth annual iC3 Life Science Summit at UT Arlington on Oct. 10. Also, you'll learn about an UT Southwestern scientist winning a $3 million award, and how MyndVR is promoting research into VR's medical role. Here are some of the research projects underway in North Texas that could make lives better. From anniversary celebrations (the Brain Performance Institute) to launch parties (WeWork Labs) to coworking (Day at the Park), browse our curated selection of events to plan your next week—and beyond. You’ll also find the Harold Simmons Park Workshops and the Mystical Arts of Tibet Opening Ceremony.